One of the most pleasant features of OnTime is it’s workflow editor – it allows to create custom workflows from as simple as “New – In Progress – Done” to complex procedures. A process within software development frequently starts with either a user story for a new feature or with a bug report. 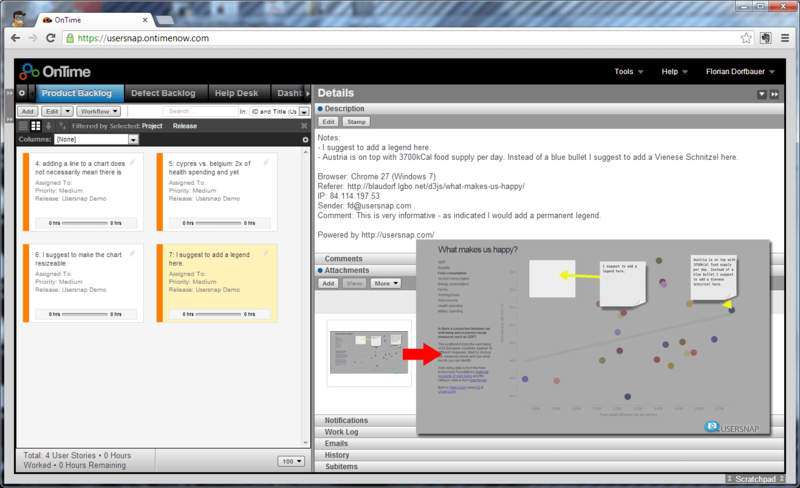 Usersnap can be used for both starting points: it allows to create new user stories, directly in the browser. Also, it is the easiest way to report bugs in any web-based software project. Collecting feedback continuously is a key ingredient to every agile software development project. It’s also covered in the famous Agile Manifesto: as not every requirement can be collected at the beginning of a development cycle, involving the stakeholders is very important. 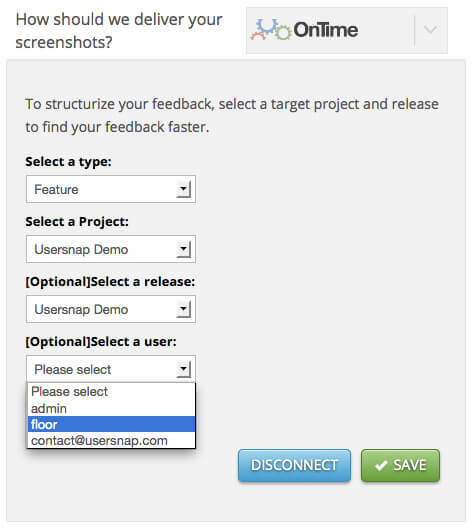 Usersnap is particularly useful to collect feedback and track bugs during such cycles. Due to it’s simplicity, it allows internal QA-teams and external customers to contribute feedback. Usersnap let’s everyone give visual feedback by simply hitting the Usersnap feedback button. 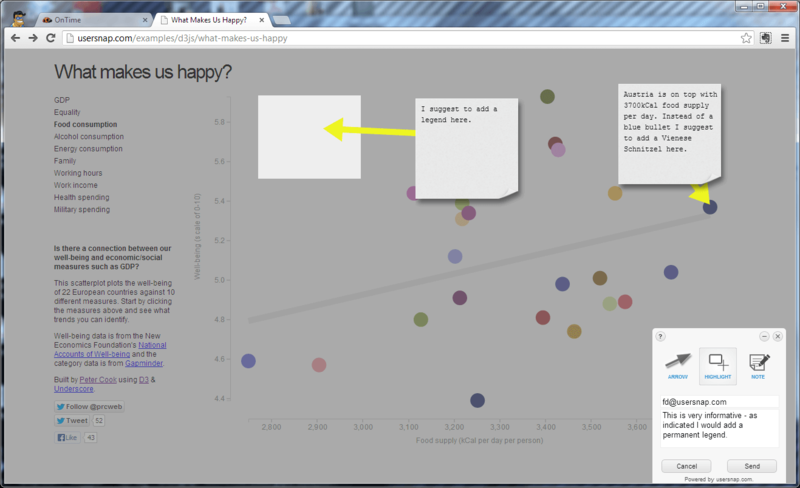 Testers or customers can annotate the current screen in their browser. The annotated screen is transmitted to OnTime, subsequently. Again, this is another claim of the Agile Manifesto: Users and Interactions over Tools. Below, I’ve set up a quick demo project to illustrate how to get even more agility to your OnTime installation. 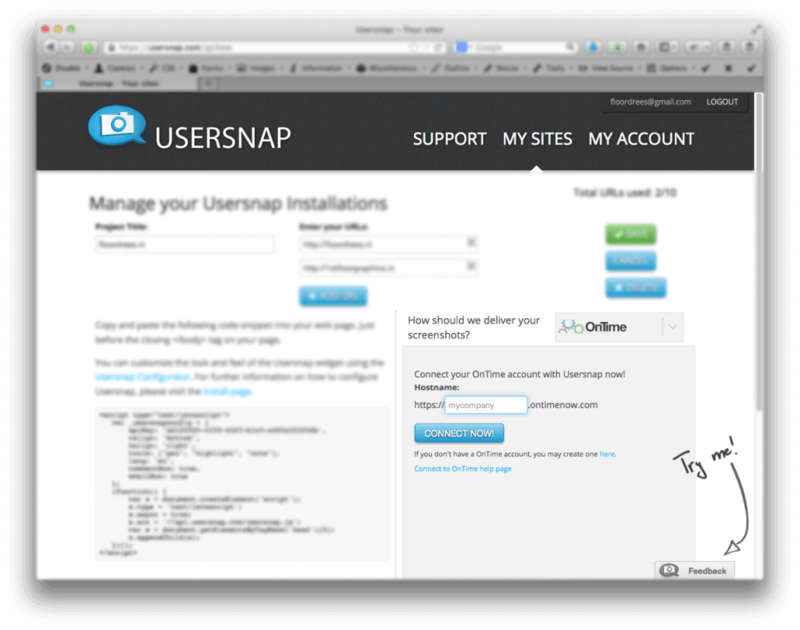 All you have to do to get visual feedback with OnTime is to sign up for a Usersnap account and enter your OnTime-URL (e.g. http://mycompany.ontimenow.com) in “My Sites”. Then, hit “Connect Now”. Finally, copy and paste the generated code-snippet to your web-project (it’s as simple as installing Google Analytics). After a connection has been established successfully, you can select a ticket type (like feature requests, bug reporting, etc). Then, pick one of your OnTime projects and one of your releases and an OnTime user which will be used as ticket creator. How does it look like in the wild? Let’s imagine you are working on an interactive data-driven document with d3.js, such as this example by Peter Cook. Describing issues textually can be a quite a hard task, specifically when pointing to them would be a matter of seconds but describing them in a ticket would take you 15 minutes. Below, you see how annotations can be added with Usersnap – it’s like sketching on paper. The annotated screenshot is automatically transfered to your OnTime account, after you click “Send”. The screenshot will arrive in OnTime attached to a new ticket where it can be assigned and discussed. Moreover, the new ticket also contains meta information such as the used browser, the operating system and the URL where the feedback was given. This is particularly useful when it comes to browser-specific bugs. Point-and-click reporting is almost always more effective than describing an issue textually. Moreover, its an effective way to collect feedback from people outside of your dev team as it’s easy to use. Feel free to try out Usersnap in combination with OnTime – a 15-day free trial is available!